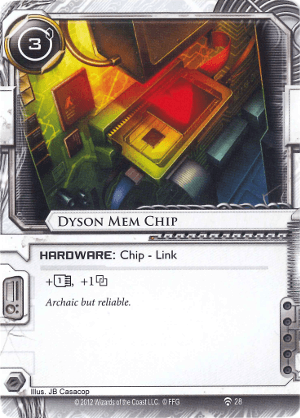 Another old card without review. Let's fix it. But well, what to say ? 1 influence point less outside of Shaper. You'd better need its 2 effects to include it in your deck, because 3 is a harsh cost for just one of them. If you just want the , Access to Globalsec is cheaper. If you just want the , find something else. Yeah, I know, there's no other neutral cards that provide apart the quirky Q-Coherence Chip, but heck, even if you certainly have some good reasons to include so many program in your deck, maybe you don't have to install them all in every game, after all. That said, if you're playing a Runner with 1 from start and have a hunger for , you can drop some along with Underworld Contact.